Situated on Bainbridge Island, just a 30-minute ferry ride from Seattle, is a net-zero residential community designed as a new model of eco-urbanism. Grow Community was designed by Davis Studio Architecture + Design and is the first endorsed One Planet Community to be built in North America. Davis Studio Architecture + Design, creator of pieceHomes, is responsible for the design and construction of the panelized prefab homes. 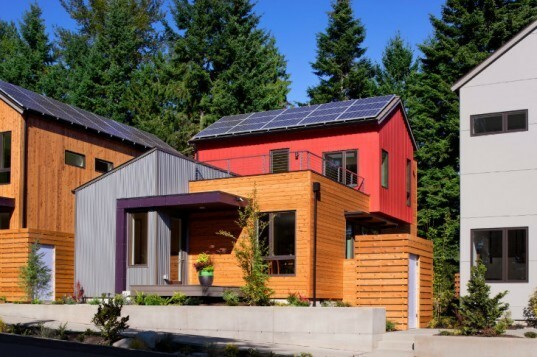 So far they've completed three net-zero homes, which will serve as models for those interested in becoming part of the community. 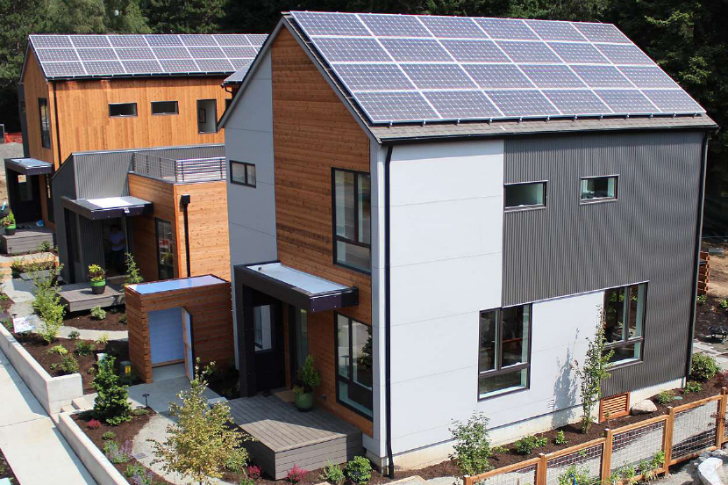 Grow Community is an 8-acre net-zero housing development near Winslow on Bainbridge Island. Just a five-minute walk to downtown Winslow, the community is aptly situated to enjoy both the urban and rural pleasures. Although still under construction, the project will ultimately include 131 residential units with 50 single-family homes and 81 multi-family units. The project is organized into micro-neighborhoods grouped around shared green space and gardens. Pathways meander throughout to connect to all the homes as well as to play areas and park-like settings. Owners and renters within the community will have access to car and bike share programs along with gardens in which to grown their own food. Housing within Grow Community has been designed by Davis Studio Architecture + Design. The homes are all designed with an emphasis on energy efficiency and will be powered by rooftop photovoltaics in order to create a net zero community. Partially prefabricated off site, the panelized homes are then assembled in the development for faster and more resource efficient construction. So far, there are three single-family homes already complete and these will serve as model homes for those interested in the development. Thanks for the great article! If you're interested in learning more about Grow Community head over to our Facebook page (http://www.facebook.com/growcommunitybainbridge) for updates. Grow Community is an 8-acre net zero housing development near Winslow on Bainbridge Island. Just a five minute walk to downtown Winslow and a 35-min ferry ride into Seattle, the community is aptly situated to enjoy both the urban and rural pleasures. Although still under construction, the project will ultimately include 131 residential units with 50 single family homes and 81 multi-family units. The project is organized into micro-neighborhoods grouped around shared green space and gardens. Pathways meander throughout to connect to all the homes as well as to play areas and park-like settings. Owners and renters within the community will have access to car and bike share programs along with gardens in which to grown their own food. Housing within Grow Community has been designed by Davis Studio Architecture + Design. The homes are all designed with an emphasis on energy efficiency and will be powered by rooftop photovoltaics in order to create a net zero community. The homes are partially prefabricated off site, then assembled in the development for faster and more resource efficient construction. Interior of one of the three completed model homes. Kitchen of one of the three completed model homes. The homes designs have a northwest modern aesthetic and are modular in concept. Panoramic view of the three completed model homes.